Because the face of God is there. “You are not a Christian,” I repeated in a withering tone. “You’re a bleedin’ agnostic. You don’t even know what ‘being a Christian’ means.” He was wounded. I was astounded. The word “Christian” means a lot of different things to different people. Several years ago, I traveled in Malaysia. In Malaysia, you’re either Muslim or you’re not, and the laws that apply to you are different depending on which camp you fall in. This is not a matter of personal belief; it’s about how you were raised. It’s about birth and ethnicity. More than anything it’s about culture. This is the sense in which Brian was Christian. His parents were born Christian. He was raised on Christmas carols and Easter eggs and some nominal participation in a Christian community. Therefore, he was a Christian. “Everyone has to have a religion,” I was told by an educated tour guide in Sri Lanka one summer. “Otherwise what would they do for your funeral?” In his classification system, Brian and I were both Christian. We weren’t Buddhist or Muslim or Hindu. We fit, instead, in the box with the Sri Lankan Catholics whose families had converted under the Portuguese colonists and with the Baptist and Mormon missionaries who were actively building churches and pursuing converts as we spoke. Our personal beliefs were largely irrelevant—interesting, perhaps, but if our minivan had gone off the road and they couldn’t ship our bodies home we would have received a Christian burial. In Evangelicalism, this kind of Christianity doesn’t count. Being a Christian means something quite explicit. Evangelicals don’t typically think of themselves as Evangelicals the way that Catholics think of themselves as Catholics; they think of themselves as Christians. And, they think of those other folks: Catholics, Seventh Day Adventists, Quakers, twice-a-year churchgoers like Brian, and even many devout Anglicans, Lutherans, Presbyterians and members of older Christian lineages as not-Christians. To be a Christian in the eyes of an Evangelical, you must take the Bible literally, accept a set of doctrines that derive from this biblical literalism and have a born-again salvation experience. Though even Evangelicals have their minor theological differences, Evangelical Christianity demands allegiance to a very specific set of beliefs. 1. There is one God who is immutable, supreme, eternal, and perfect. Moreover, this God, the one and only God, is omniscient, omnipotent, omnipresent, and Good. That means he is everywhere, knows everything, is all powerful, and essentially defines the concept of goodness. God is perfectly merciful, just, and loving. He is unchanging, the same yesterday, today, and tomorrow. He is the God of Truth, opposite in this regard to Satan, the devil, the Father of Lies. Evil is external to the Christian God, alien, outside of him. Sometimes, in fact, that is how evil is defined: anything alien to the nature of God. God is not capable of evil. 2. This one God consists of three “persons.” At some level not quite comprehensible to us, God has three parts, called the Trinity: God the Father, God the Son (Jesus), and God the Holy Spirit. This is considered to be one of the glorious mysteries of the Christian faith. God the Father is localized in heaven, his dwelling place, but can also be thought of as existing throughout the universe. On Earth, he is present in all of nature, which he created, and we may see his power, goodness, and glory in the wonders of the natural world. In the Old Testament, he occasionally spoke audibly to selected humans or took on human form to converse with them. Jesus, the second part of the trinity, was a historical human being who was also fully God. The third part of the trinity, the Holy Spirit, does not have a human form. The Holy Spirit is a power or a presence which participated in creation and dwells in believers, enlightening and guiding them. These three persons constitute God. 3. Humans are made in the image of God but are inherently evil. All humans commit acts of evil or sin. Even if they didn’t, they would still be sinful because Adam and Eve, ancestors of all humans, broke God’s law in the Garden of Eden. They were told not to eat from the Tree of Knowledge of Good and Evil, but they did. This is how sin and suffering entered the world. Prior to this, the world was perfect. All humans have inherited the guilt of this sin simply by being born. This is called original sin. Humans are born sinful. In addition, all humans break God’s laws of their own volition. This can be called universal sin. 4. Each human has an eternal soul that remains conscious individually The biblical descriptions of heaven and hell are woven into the very fabric of our culture. Who has not heard of the streets of gold and the fiery pit? Many take these descriptions literally; some do not. At minimum though, believers seem to agree that heaven constitutes some eternal state of bliss and union both with God and with other believers, while hell is some state of anguished separation from God and goodness. 5. Because of sin, both original sin and universal sin, the eternal soul of each human is alienated from God for eternity. For the wages of sin is death (Rom. 6:23). All humans deserve and are condemned to an eternity of torment, which they have brought upon themselves by their sin. 6. The perfect blood sacrifice could restore the relationship between God and humans, but only Jesus Christ (God incarnate) is/was perfect enough to become this sacrifice, which he did. This is called “substitutionary blood atonement.” We all, like sheep, have gone astray, each of us has turned to his own way; and the LORD has laid on him the iniquity of us all (Isa. 53:6). Jesus was perfect enough to do this because he did not have a human father and thus had no original sin, which is passed on to children through their fathers. * Mary, the mother of Jesus, was impregnated by the spirit of God. This is called the virgin birth. 7. The sacrifice of the human-God Jesus restores a pure relation between God and humans only if humans believe in and accept this sacrifice.This theme repeats throughout the New Testament. Acts 16:31 says, And they [meaning the Apostle Paul and Silas, the first Christian missionaries] said, “Believe in the Lord Jesus, and you shall be saved, you and your household.” Conversely, those who are not saved by Christ’s sacrificial death are doomed. In the words of the gospel writer: “He who has believed and has been baptized shall be saved; but he who has disbelieved shall be condemned” (Mark 16:16). Anyone who does not believe in redemption through blood sacrifice is not a real Christian. 8. Jesus will return to earth in immortal but human form and will take all real Christians to live with him eternally. The world as we know it will end. Jesus will appear in the clouds and those believers still remaining alive will rise up to be with him. Then, in a tempest of plagues, famine and bloodshed, nonbelievers and this earth will be destroyed, and the “God of This World,” Satan, will be cast into a fiery pit for eternity along with demons and anyone who is not a real Christian. 9. God cares about individual humans and intervenes in the course of nature in response to the prayers of Christians. Each individual is precious to God and is a part of his awareness. “His eye is on the sparrow,” we are told. The relationship between the believer and God is a personal one. Christians are commanded to pray, to talk to God as a form of worship and confession. Prayer, in the Bible, is described as an attitude of spiritual communion, as in pray without ceasing (1Thess. 5:17), but Christians are urged also to make specific requests of God. Prayer is an opportunity to ask for what you want. “For what man is there among you when his son asks for a loaf, will give him a stone? Or if he shall ask for a fish, he will not give him a snake, will he? If you then, being evil, know how to give good gifts to your children, how much more shall your Father who is in heaven give what is good to those who ask Him!” (Matt. 7:9–11). God answers prayer by giving people what they ask for. 10. God performs miracles. This means he makes exceptions to the laws of nature to show his power and to assist his faithful. A miracle can be in response to prayer, as when a prayed-for healing occurs, or it can be a spontaneous act of God, as when he strikes unbelievers with plagues or drought. It can be a simple sign of God’s existence, as when the face of Jesus appears in a puddle of paint or it can result in the annihilation of an entire people. Protestants tend to emphasize small miracles, events that could occur within the bounds of nature but wouldn’t have without God’s intervention—in other words, God tweaking the system. Catholics are more open to unexpected signs and wonders. Both believe that Jesus performed a wide range of miracles during his time on earth. 11. The natural world and the Bible are God’s revelations of himself to humankind. God not only created the natural order but actively sustains it. As a work of art reflects the artist, so nature reflects the character of her designer. By experiencing nature and by using reason to study natural processes, we can learn about God who created those processes. This is called natural revelation. But nature reveals only part of what God wants us to know about himself. The rest is known through special revelation. This can include miracles, visions, spiritual intuitions, or the spirit of God speaking through church leaders, but by far the most important special revelation is the Bible and the life of Jesus as documented there. Where Did These Doctrines Come From? These doctrines were inherited, largely in their current form, from Protestant orthodoxy, and before that, from Roman Catholic orthodoxy. Evangelicalism is the child of Protestantism, which is the child of Roman Catholicism. These three make up a family; a rather conflicted, dysfunctional one perhaps, but a family nonetheless. Evangelicals often deny this heritage and pretend they are only distant relatives. But don’t be deceived. After all, children rarely like to acknowledge how much they are like their parents. The family that includes Evangelicals, traditional Protestants, and traditional Roman Catholics can be called Western orthodoxy. “Orthodoxy” means that a specific set of beliefs are agreed upon by a church hierarchy and are non-negotiable. They are right, and alternatives are wrong. “Western” orthodoxy distinguishes this family from the Eastern Orthodox family of religions and several ancient Middle Eastern lineages that predate the Roman Catholic Church. Evangelicalism began as a movement to reform Protestantism, which began as a movement to reform Catholicism. As a consequence, Evangelical reform elements can be found within major Protestant denominations and within the Catholic Church. But many Evangelicals have split off from the mainstream denominations and have established independent “nondenominational” churches. They reject the authority of any ecclesiastical hierarchy and, in particular, scorn the Pope and institutions of Roman Catholicism. Despite the similarities, Evangelicals differ from other orthodox Christians in important ways. More literal interpretation of the Bible. More emphasis on a specific single point of conversion—the born-again experience. An image of God that is more human-like and personal. A priority on individual righteousness over societal goodness. Concern about a literal Satan who works to undermine believers. Wariness of church establishments, authorities or hierarchy. Belief in a specific set of end-times prophecies. A central emphasis on proselytizing or winning converts. Although these differences seem subtle and mostly matters of priority or degree, in actual practice they can put Evangelicals at odds with other Christians. An Anglican theologian may see God as a goodness and power beyond human comprehension, while an Evangelical may see him as a friend who can be asked for favors. A Quaker may be willing to die in the service of peace, while an Evangelical may approve preemptive war and manifest destiny. A Mennonite may pour her efforts into missions of mercy, and lobby for resources to tend the poor, while an Evangelical preaches individual redemption and, at a societal level, individual consequences for individual behavior. A United Church of Christ member may insist that Christ’s model demands loving acceptance of homosexuals, while an Evangelical ministry tells gay teens that they are condemned unless they go straight. A Presbyterian may be horrified by the thought of a mid-eastern bloodbath, while an Evangelical may welcome it as a sign that Christ’s return is imminent. If Evangelicals deny their family ties and doctrinal heritage, Catholics and mainstream Protestants often underestimate the differences. They may see themselves as part of a brotherhood of faith, failing to recognize that some Evangelicals share their core doctrines without sharing their moral and spiritual priorities. Consequently, they tend to be uncomfortable speaking out even when Evangelicals violate these priorities. It’s all in the family, right? Imagine their surprise when they find themselves targeted by Evangelical missionaries who see them as either heathen or fallen from grace. The very real overlap and equally real differences between Evangelicals and other orthodox Christians make it hard to talk about Evangelical beliefs and practices without drawing in other kinds of Christian orthodoxy. Some topics in this book apply only to Evangelicals. Other parts apply more broadly to the Western orthodox family. When Evangelicalism shares the beliefs and practices of her parent religions, I cannot address one without the other. Also, because Evangelicalism builds on her ancestor faiths, the history of Evangelicalism is the history of the Western Church, which becomes a part of my discussion. Here is one additional and important point of clarity: this book makes no attempt to address the entire spectrum of Christian belief. “Behold,” says the psalmist. “Behold, how good and how pleasant it is for brethren to dwell together in unity!” (Psalm 133:1 KJV). I wonder what he would have thought of Christendom. In the two thousand years since its birth, Christianity has encompassed an enormous range of theism centered on the person of Jesus of Nazareth. The boundaries of Christianity include many who have believed in the deity of Jesus and many who have not. Some have held that the Judeo-Christian God was just one of many supernatural beings; some have been monotheists to the point of rejecting the doctrine of the trinity: one God consisting of three persons: Father, Son, and Holy Spirit. Some have insisted that heaven is rewarded to those who believe, while others have retorted that heaven is for those who emulate the compassion of Jesus. Some have held that without the sacrifice of Christ on the cross, humans would be doomed to eternal anguish; others have argued that this notion of human sacrifice is a perversion, introduced into Christian thinking by surrounding pagan beliefs. Some have studied the sacred feminine, pointing out that God must encompass all virtues, male and female others have insisted that God is a father and that the gender of Jesus reflects the nature of divinity. It is virtually impossible to address the range of Christian beliefs without resorting to a general discussion of monotheism. In the twentieth century, faced with findings in the fields of anthropology, archeology, physics, geology, biology, neurology, and psychiatry, as well as linguistic and historical analysis of the Bible itself, many Roman Catholics and Protestants adopted a symbolic interpretation of the Bible and Christian doctrine. These Christians are called modernist or liberal, which, according to my dictionary means favorable to progress or reform. Liberal Christians may think of the stories of the Bible as sacred metaphors. They may believe that the scriptures imperfectly reflect the struggle of imperfect humans to conceive of a Power and Goodness beyond imagining. They may be more inspired by the life of Jesus than by his death. 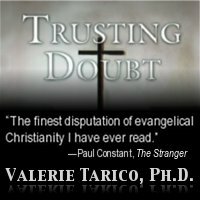 Many of these Christians would find the issues discussed here largely irrelevant to their faith, my book examines beliefs they simply do not hold. I should note that, although such Christians are called “modernist their lyrical worship is ancient. So is their struggle to see beyond sacred writings and rituals to incomprehensible truths. The profound spiritual experience of mystics, the cloistered contemplation of monks and nuns and the simple routines of ascetics all share core elements with modernist worship. In each of these, the Bible and Christian creeds are experienced not as scientific or historical records but as finite, imperfect tools that open paths to transcendence, to deep communion with God and creation. Modernist Christians believe that this type of worship is closer to that of the Christian fathers than is the literalism of today’s Evangelicals. In fact, they may see the biblical literalism of their orthodox brethren as a kind of idol worship: as taking something made by humans and elevating it to a status that rightfully belongs to God alone. The Evangelical view that the Bible is perfect and that each verse is an intentional message from God cannot be overemphasized. Orthodox Catholics believe that God guided the composition of the Bible, lending perfect judgment to the church authorities about which of the many available writings to include and which to reject. Other orthodox believers tend to agree with them. Most Evangelicals take this a step farther and insist that the Bible is inerrant, meaning without error, and that each word of the original was essentially dictated by God to the authors. The Bible can make no mistake. Where it appears to be mistaken or contradictory, this is simply a result of our human limitations. The only errors are errors in translation or transcription, of which there are very few and none that would change our understanding of major doctrines. Many of the differences between Evangelicalism and other forms of Western Christianity derive from the extraordinary status given to the Bible by Evangelicals. Taken out of historical context, freed from its ancestor documents, writers, compilers, and translators, the Bible becomes a timeless direct communication from God to the believer—or to the believer’s pastor who acts as God’s translator. Virtually all of what this book calls the dark side of Evangelicalism stems from this one aspect of the faith. This context-free literalism ties Evangelicals to the traditional doctrines listed above, preventing the theological growth that might otherwise accompany our growing understanding of ourselves and the world around us. It allows Evangelicals to disown the ugliness of Christian history, to deny that it is the history of their own faith, and, consequently, to deny their own potential pitfalls. Worse, it binds Evangelicals to a series of ancient concepts ranging from the inferiority of women to blood sacrifice to holy war, concepts that threaten the fabric of our pluralistic society and ultimately the viability of human life on earth. The issues explored in this book would be irrelevant to Christians were it not for two key claims made by virtually all forms of Christian faith. First, any form of Christianity stakes its legitimacy as a moral and spiritual practice on the nature of God himself. Christians claim to worship the God of Love and Truth, the God of Goodness, Mercy, Justice, Joy, and Peace—the only possible kind of God worthy of worship. To the extent that the beliefs and practices of any Christian religion violate these Divine attributes, that religion violates its own God and claim to legitimacy. Second, virtually all Christians believe that their faith is reasonable. God makes his truth recognizable to us humans through our minds as well as our emotions. Without this assumption, the whole field of theology would disappear. Two thousand years of theologians and evangelists, from the Apostle Paul to Thomas Aquinas to Martin Luther to Pat Robertson have spent their lives propagating their beliefs by appealing to reason and real world evidence. Defenders of the faith argue that belief is rational: although faith may be beyond reason, it is not counter to reason. Again, to the extent that any Christian religion clearly violates reason, it violates its own reason for being. In the coming pages, I will show that Evangelical teachings counter both reason and morality. If, as Christianity claims, we were created by a God whose defining attributes are Goodness and Truth and whose greatest commandment is Love, then Evangelical doctrines and practices violate this God. And to the extent that any of us care deeply about honoring truth and goodness in our personal lives and in our society, we should care deeply about the growing power of Evangelicalism to distort both. Gallery | This entry was posted in Trusting Doubt: Individual Chapters and tagged biblical inerrancy, blood atonement, Christian orthodoxy, evangelical doctrines, evangelical teachings, Evangelicalism, four spiritual laws, fundamentalism, plan of salvation, what evangelicals believe. Bookmark the permalink. I am absolutely dumbfounded with your site! It’ll take me forever to read it all! I can hardly wait :) Thank you for putting this together. Just a little aside though, how is your depression since you’ve come to this point in your beliefs. If you don’t mind me asking, of course. I know that since I renounced my beliefs in a god I have been so much happier. Thank you for putting this site together! Thank you for your compliments! It sounds like my experience is similar to yours. My religious beliefs were definitely contributing to my depression, although I would guess I was vulnerable for other reasons. Maybe a better way to put it is that the religious beliefs trapped me in ineffective solutions. When I found new ways to put the pieces together I was free to see the real world factors that were problems, and then I could actually work on them. Hi, Dr. Tarico, I’m Robert. Mark Mythos of Free Thought Radio interviewed me for his program, "The Free Thought Zone", where I related how I suffered with paranoid schizoprenia for ten years. I became a skeptic because of my horrifying experiences with this illness, and it assisted me in making a significant recovery. He may discuss me in his interview with you coming up. Regardless, I’m looking forward to the interview. My blog is http://www.permscape.blogspot.com. Take care, Doctor. Thank you for differentiating Evangelicalism from other Orthodox groups. Many people mistakenly lump all of Protestantism into one category without understanding the stark contrasts in belief.